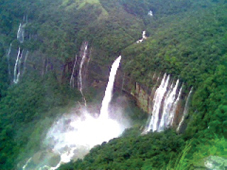 Nohkalikai Falls in Sohra. File photo. SHILLONG: A one-day Seminar on Preservation and Conservation of Historical and Cultural Heritage of Sohra was organised by the Internal Quality Assurance Cell (IQAC) of Lady Keane College here in collaboration with the Indian National Trust for Art and Cultural Heritage (INTACH) Meghalaya Chapter and the Meghalaya Rural Tourism Forum (MRTF) on Tuesday at Jiva Resort, Sohra. The main objective of the programme was to promote and preserve the heritage of Sohra by empowering the people towards sustainable tourism, with special emphasis on heritage tourism. Kynjing, MCS, Sub-Divisional Officer (C), Sohra Civil Sub-Division was the Chief Guest on the occasion. The seminar saw the participation of a number of stakeholders working in different tourism development programmes in Sohra, Headmen and Students from various institutions under the Sohra Civil Sub-Division. In his speech, L Kynjing informed that the Sohra region was blessed by the presence of a number of heritage sites and the promotion of such sites would increase employment opportunities for the people residing in the area. He expressed his gratitude to the organisers for conducting such a programme and stated that the seminar was a much needed initiative especially for the different people and stakeholders working or involved in various tourism projects around Sohra. He, however, expressed his regret that a number of heritage sites had been lost due to unplanned development. “Exploitation of natural resources generates income for one generation only whereas tourism development projects and activities can provide income for generations” he said. He also lamented that there were a number of such sites which had been vandalised or defaced, which is a serious issue that needs to be looked into. He further stressed on the importance of proper tourism management and the need to control the number of footfalls at the various heritage sites. She highlighted that hundred years ago, the people in the region, despite not having architects, engineers etc., built houses using masons and craftsmen, and these structures had stood the test of time. She further added that the natural heritage of the region which includes rivers, caves, waterfalls etc., should not only be admired but also respected as various myths and legends were interwoven with the natural landscape.